Is there a better way? Ryan seems to be baffled. People have already seen what our replace it. Go to www.better.gop if you want to take a look at our replace. […] So we already know what we’re replacing with. We’ve been extremely clear with what replace looks like. At Tuesday’s session, McCarthy said repeatedly that Republicans hadn’t yet decided what to do about Obamacare. “We’re being sworn in today,” he pleaded.What are some possible alternatives? But here’s what’s really rich. Ryan himself, on Wednesday, said they have “plenty of ideas” and will reveal them in the months ahead. 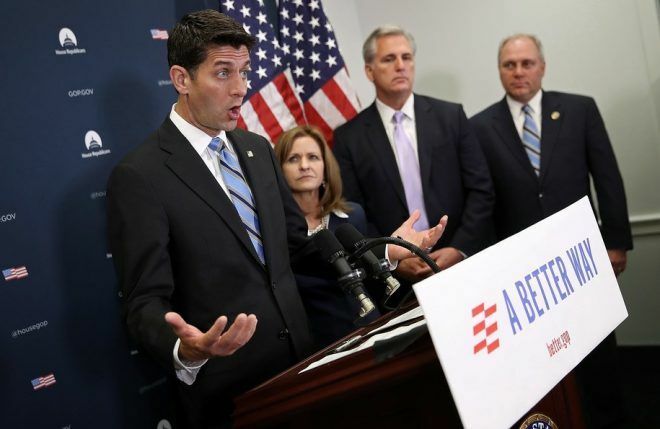 Did Paul Ryan forget the big Paul Ryan plan he released before the election, when he was trying to distract the public from the Dumpster fire that was their presidential candidate and will soon be their actual president? The idea that Republicans would just pretend to repeal Obamacare and just rename it Trumpcare or Ryancare or Freedomcare is seeming less and less far-fetched by the day.